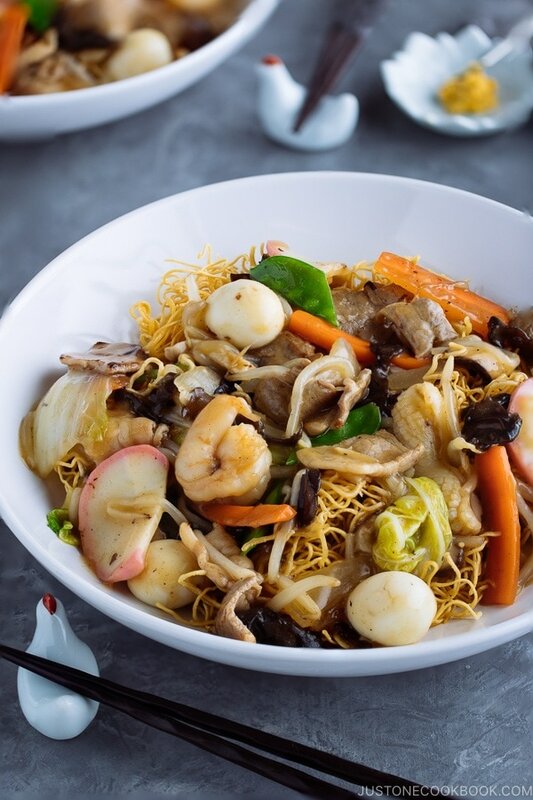 A Japanese take on the popular Chinese crispy noodles with saucy seafood and vegetables. 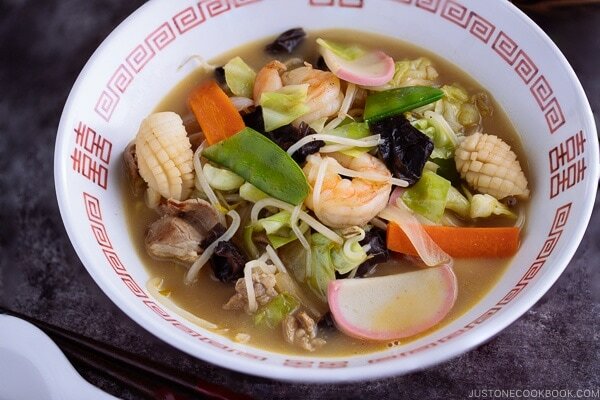 Forget take-out and make this Nagasaki Sara Udon tonight instead! Since I was small, I’ve always loved foods that have a crispy and crunchy texture, and Sara Udon (皿うどん) was no exception. 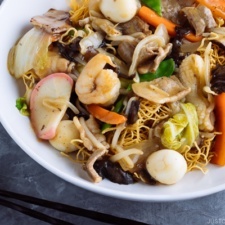 This noodle recipe is the Japanese version of the classic Chinese dish – Crispy Noodles with Seafood 海鮮炒麵, featuring stir-fried seafood, pork, kamaboko fish cake, cabbage, bean sprouts, and other colorful vegetables, atop a bed of pan-fried egg noodles. Sara Udon was always my first favorite at the Japanese-style Chinese restaurant while the other kids would go for Chahan (炒飯 – fried rice) or Gyoza. When the plate of noodles served in front of me, I made sure to devour the crispy bits of noodles as fast as possible before they get wilted from the remaining heat of the sauce on top. Sara udon (皿うどん), literally means “plate noodles” in Japanese. 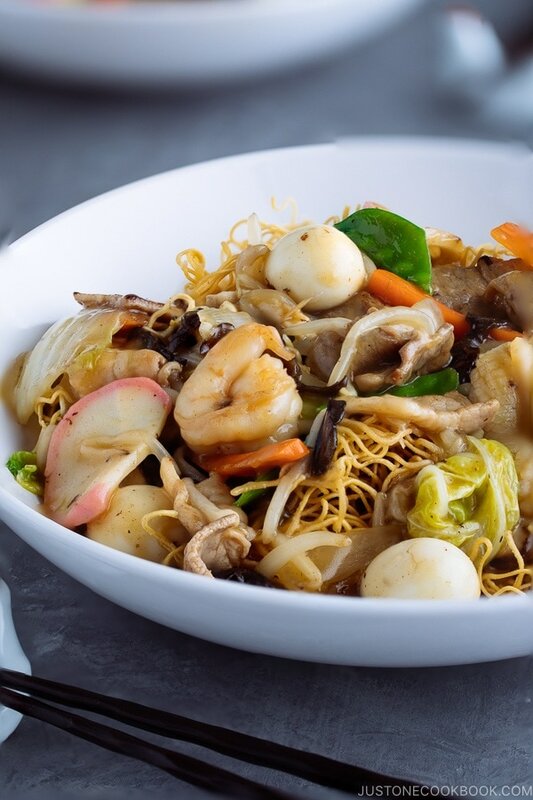 It consists of two parts: crispy fried noodles on the bottom and stir fried seafood, pork, and vegetable sauce on top. All the ingredients in the soup are thickened with a small amount of slurry, so they coat well with the noodles. By now you’re probably wondering where is the “udon noodles” as it’s called Sara Udon. Well, the definition of udon can be a little ambiguous at times. Before it was called Sara Udon, the dish used to be one of the versions of Champon – a noodle dish introduced by a Chinese restaurant Shikairō (四海楼) back in Nagasaki, where Champon was first created. If you are not familiar with Champon, you can read my post first. Thick Champon noodles, which look slightly like a thinner version of udon noodles, were served on a plate, and the ingredients were served over the noodles without soup for the ease of home delivery. Since the noodles were served on the plate, this version was eventually named Sara (“plate”) Udon instead of Champon. Later on, thin noodles that are fried to crispy were introduced and became another version of Sara Udon. 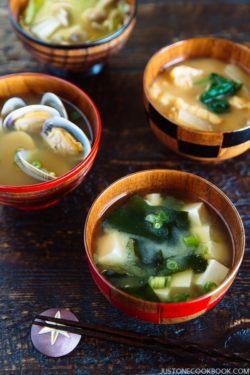 The soup thickened with slurry and that has become the mainstream of what Sara Udon is nowadays. These days you can find Sara Udon being served with two different styles of noodle. The first style is similar to Cantonese-style crispy chow mein (or more notably Hong Kong Crispy Chow Mein) where thin egg noodles are fried in oil till crispy. The second style uses thicker Chinese noodles that are pan-fried like Chanpon noodles. Both are common in Nagasaki, but Sara Udon outside of Nagasaki area mostly use thin crispy noodles. 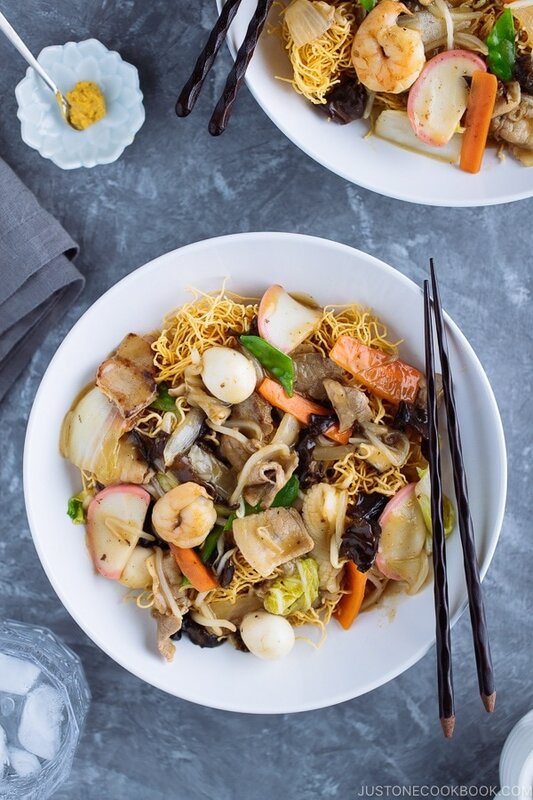 Where to find crispy noodles? 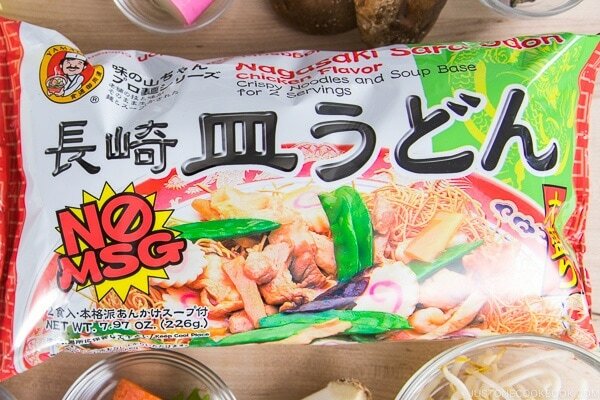 I found this Nagasaki Sara Udon package in my local Japanese grocery store Nijiya Market and I use only the noodles and skip the soup base. If you don’t have a Japanese market nearby, you can visit a Chinese grocery store and look for crispy noodles in a bag. If you prefer to make your own, you can deep fry or pan fry the Hong Kong noodles in your wok. Pork belly slices (no, it’s not bacon. It’s the pork cut used for making bacon. You can find it in Japanese, Chinese, Korean, or Mexican grocery stores. If they only sell a block of pork belly, slice your own following my tutorial). This may look like a daunting list of ingredients, so you can certainly simplify the ingredients or switch things up with whatever you have on hand. The soup base is chicken stock/broth. You can use homemade chicken stock if you have it around (Here’s my chicken stock recipe), or use packaged chicken stock. Each package comes with different saltiness so please adjust the soup base accordingly. It’s important to keep a spoon around and always taste before you finish cooking! 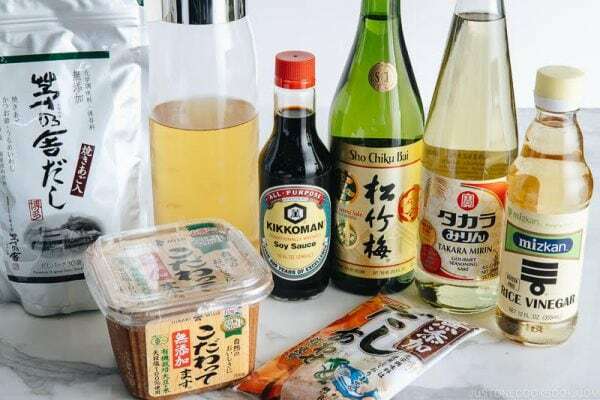 To make a vegetarian or vegan-friendly version of Sara Udon, please use a vegetable broth and “Vegetarian Mushroom Flavored Stir-Fry Sauce” instead of oyster sauce. 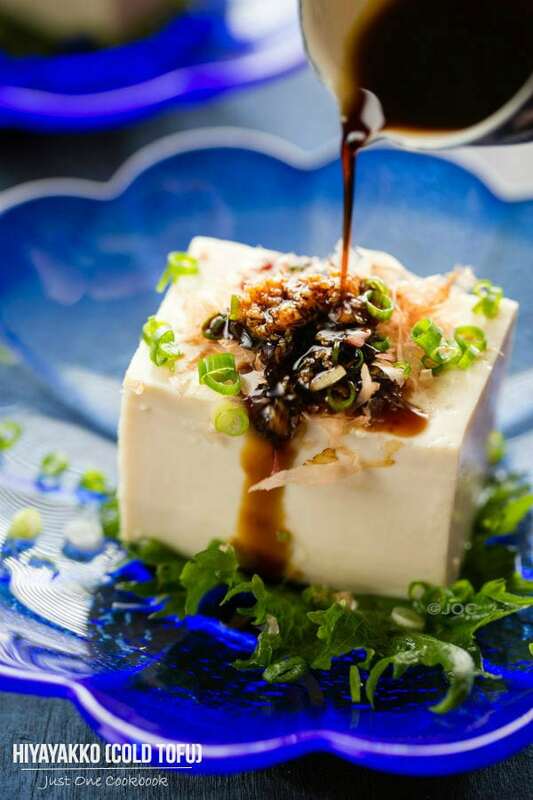 For protein, you can easily use deep-fried tofu or pan-fried tofu in place of seafood. I was inspired to make this noodle recipe after watching the popular Japanese TV drama – Kodoku no Gurume (孤独のグルメ) [Season 6: Episode 7]. The protagonist Gorō-san had a bowl of Sara Udon at Nagasaki Hanten (長崎飯店) in Shibuya. It was exactly the noodles I used to order at Chinese restaurants growing up. So I got to share my version of this recipe! For those of you who are not familiar with Kodoku no Gurume, the main character Gorō is a Japanese salaryman who is in sales. As a salesperson, Gorō travels across Japan for his work and on each business trip he visits various restaurants and street booths to sample the local cuisine. Each chapter features a different place and dish. This TV drama has been around for years in Japan, and currently Season 7 is on air. Unfortunately, it is not available on Netflix like Midnight Diner: Tokyo Stories here in the States, but it’s available on Netflix Japan and other sources. Maybe Netflix USA will pick it up if there’s enough interest for the drama. You can find some of the older seasons available in DVD format on Amazon. Whether you have access to Kodoku no Gurume or not, I want to share all the delicious foods the main character Gorō-san enjoyed in the show and I hope you would join me in cooking up these dishes. 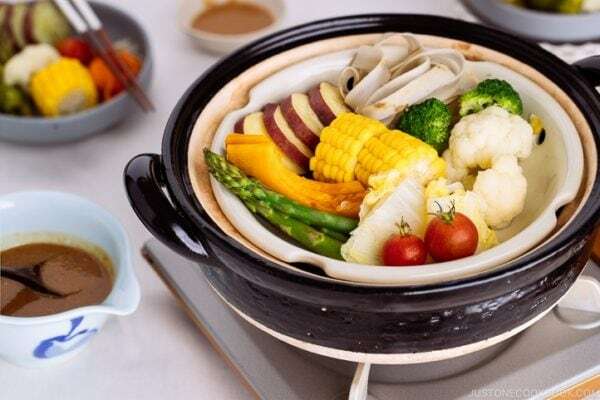 Sara Udon is a Japanese take on the popular Chinese crispy noodles with saucy seafood and vegetables. 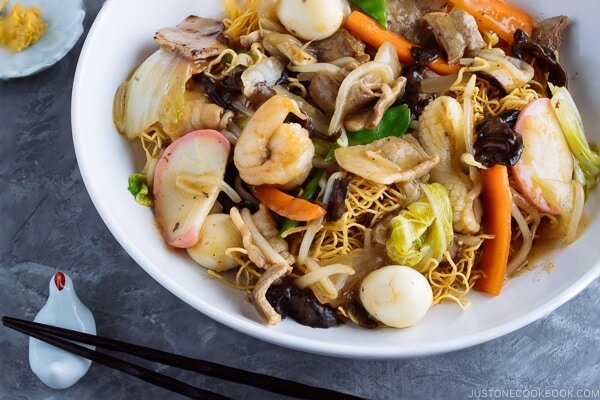 Skip take-out and recreate this noodle dish at home! Combine 1 ½ cup chicken broth, 1 Tbsp oyster sauce, ½ Tbsp soy sauce, and 2 tsp sugar. Mix all together well. Add 1 tsp sake to pork, shrimp, and squid to remove any odor. Add 1 tsp soy sauce to the pork and combine well. Set aside. Rehydrate the dried wood ear mushrooms and cut into smaller pieces. Bring a small pot of water to a boil. Take out the quail eggs from the refrigerator and carefully place in the boiling water. Reduce the heat to medium-low and cook for 3 minutes. Once they are finished cooking, place the quail eggs in iced water. Once cool, remove the shell. Score the squid in the crisscross pattern by making parallel diagonal lines. Make sure not to cut it all the way through. Thinly slice the kamaboko fish cake. Cut the onion into wedges and then cut in half widthwise. Thinly slice the carrot into slabs. Then cut them in half lengthwise. Cut the napa cabbage into roughly 2 inch pieces widthwise and then cut them in half lengthwise. Remove the stems of shiitake mushrooms and slice the caps. Remove the strings from snow peas and cut in half. To make the slurry, in a small bowl combine 6 Tbsp water (make sure it’s not warm/hot water) and 2 Tbsp potato/corn starch and whisk well together. Carefully loosen the crispy noodles on the plates. Heat the wok on medium-high. Once the wok is hot, add 1 Tbsp sesame oil and the pork. Separate the pork and add the shrimp and squid. Stir to combine. When the meat is no longer pink, add the onion. Stir well until coated with oil. Add the hard bottom part of napa cabbage and wood ear mushrooms. 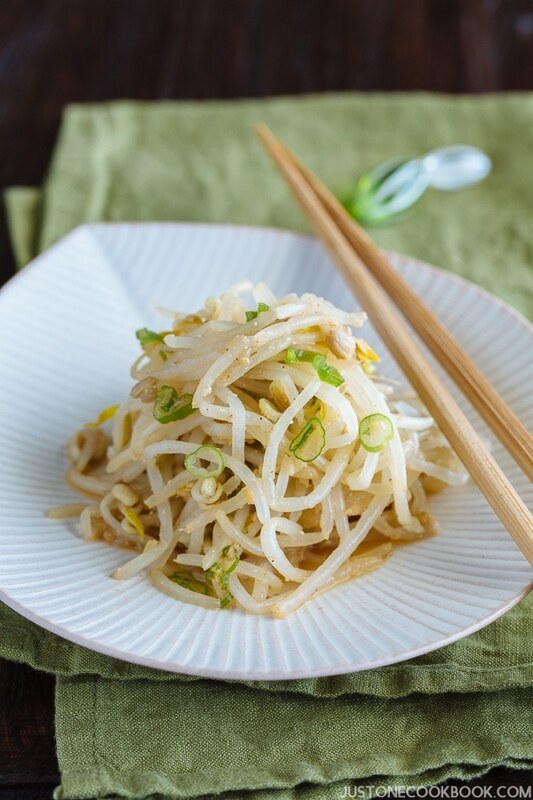 Add the carrot, leafy parts of napa cabbage, and bean sprouts. Add the shiitake mushrooms, kamaboko fish cakes, and snow peas. Add the soup into the wok and mix well. Add the quail eggs. Season with ⅛ tsp white pepper and 2 tsp kosher. Taste the soup to make sure the flavor is good. Whisk the slurry one more time and add to wok. Mix well. 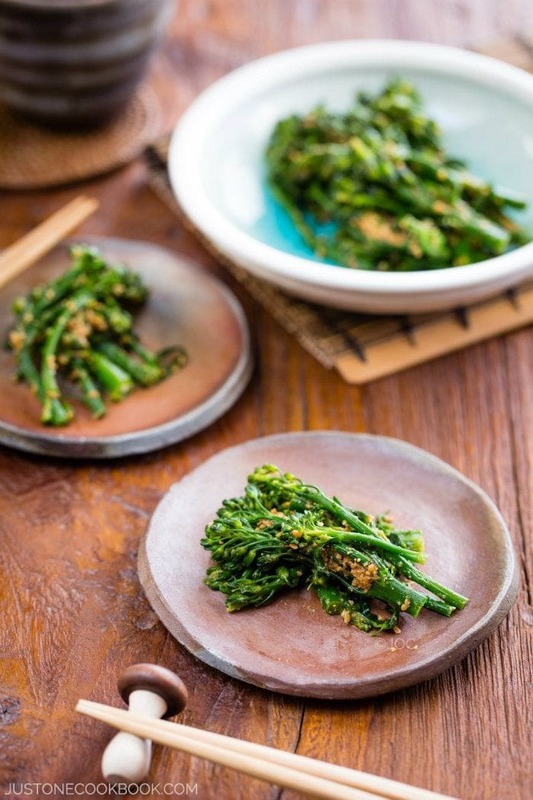 Pour over the crispy noodles and serve with karashi mustard and rice vinegar on the side. You can a tiny dab the mustard on noodles (you don't have to mix it) if you like. When you feel a bit bored with the same flavor, drizzle some vinegar for a change (that's how the TV show shared how to eat this dish). Enjoy! I may have to add it to this months shopping list! It looks so good! Love to watch you making the stir-fry of all my vey favourite things . 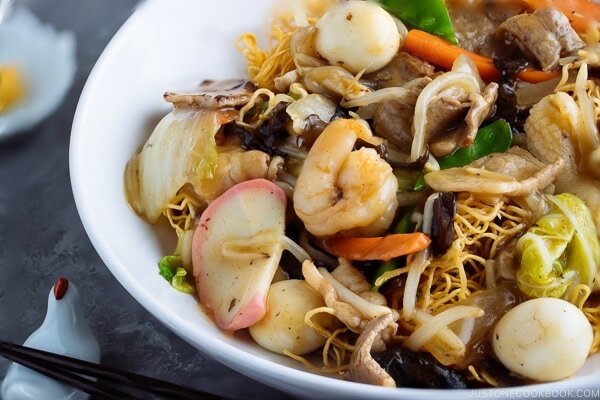 . . .well, perhaps I’ll skip the crispy noodles because of fat used to prepare them and use some usual soft ones but it will be a very tasty dish nonetheless ;( ! At “Ringer Hut” I usually ordered “Champon with Crispy Noodles”; they had a spicy condiment (not karashi) that I liked with it. I believe it is made from a very small, hard, green, berry-like fruit I saw my father-in-law picking off a tree in his garden. At Ringer Hut it was like a paste. Do you know what it is? HI Bond! There is one Ringer Hut in San Jose – about 40 mins from where I live too, and I’ve been there once. I don’t remember the condiment, but I’m guess it’s either sansho (but usually powder) or Yuzu Kosho (yuzu + pepper paste + salt)? Thanks so much for your prompt reply for my inquiry for kitchenware stores in Fukuoka. I am so excited to head off there tomorrow, and will let you know what I bring back home later. Glad to know you will have a trip to Montreal during the coming long weekend. Though I am not living in Montreal, it is a city I am so familiar with because my son has already been having his last year university there. The food that definitely worth to try in Montreal is poutine which is a dish originating from Quebec. The restaurant I like most for poutine is La Banquise. There are many different kinds to choose from and the portion is huge. An order is adequate for two persons (especially for ladies). But the restaurant is so popular that there is always a long queue outside. Be sure to be there at off peak dining hours. Hope you enjoy the trip and happy eating. HI Cindy! Oh I’m so glad my response was helpful. 🙂 Have a fantastic trip to Kyushu! Thank you so much for your tip! We’ll definitely try poutine, and if our itinerary works we’ll definitely try La Banquise! We’re waiting for boarding now. Can’t wait!! Hi Nami .. this comment is not related to this recipe though. I would like to make your sweet and sour chicken-Ootoya style recipe using fish fillet instead. However I am without the black vinegar. Can you kindly advise what would be a good substitute?And would the steps differ if I’m cooking with fish? As always..THANK YOU for your great recipes???? Hi NJ! Yes, you can use fish fillet for the recipe, but I would recommend to cook it separately and add toward the end right before coated with sauce. otherwise it’ll break into pieces. I would coat with flour and deep fry so it gets crispy coating and it will absorb sauce nicely too. You can use the other vinegar, but please adjust accordingly. Hope that helps! Great recipe Nami. Really enjoyed the flavours from this mix of ingredients, although I didn’t have quail eggs unfortunately. I made the karashi from the powder mix but was a little uncertain how to use it and the vinegar when eating this dish. I served each separately on the side and just added a little as I ate it but wasn’t sure whether to mix the karashi & vinegar? Can you advise? Keep up the amazing work at JOC!